Sibelius plays through IAC Driver the Logic track, on which VEP instances are open. Setting the sound set of VEP in Sibelius, all the articulations are sent to the IAC bus and then to Vienna through Logic. In this way, all audio is handled by the mixer in Logic: Sibelius is just a "player", without VST instances open. It's possible to replace Sibelius with Notion 4 and getting the same result? In other words, you can apply the template and the joints of VSL to an external MIDI port? 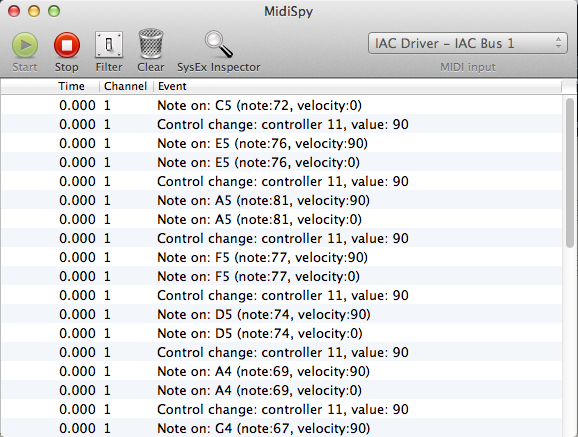 Notation 4 ---> External MidiPort ---> IAC DRIVER ----> Logic Pro ---> VEP? QUESTION: Is there a specific reason for having Vienna Ensemble Pro 5 hosted by or connected to Logic Pro X? 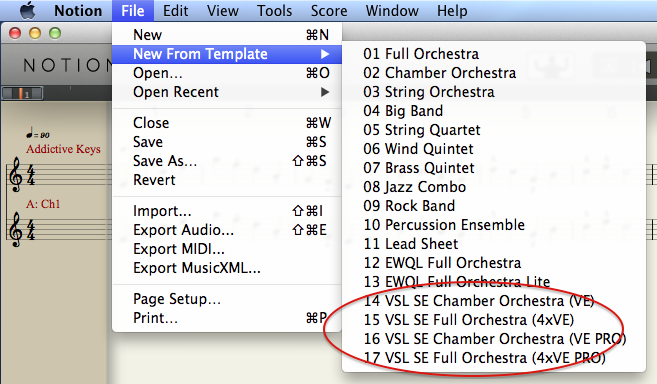 QUESTION: Why not connect Vienna Ensemble Pro 5 to NOTION 4; use the VSTi version of Vienna Symphonic Library in NOTION 4; or use one of the predefined templates for Vienna Symphonic Library products, since the latter have custom rules specific to Vienna Symphonic Library products, which maps to being tailored to Vienna Symphonic Library products? If your Mac has sufficient system memory--which I define to be 16GB or greater--then you should be able to use a Vienna Symphonic Library instrument in NOTION 4, which includes being able to use Vienna Ensemble Pro 5 as a streaming server to provide Vienna Symphonic Library instruments to NOTION 4 . . . Using Vienna Symphonic Library directly in NOTION 4 makes it possible to use the specific predefined NOTION 4 rules for Vienna Symphonic Library . . .
You can use Logic Pro X as the mixer application in a ReWire 2 session where Logic Pro X is the ReWire 2 host controller and NOTION 4 is a ReWire 2 slave. In this scenario, NOTION 4 handles the audio generation in conjunction with the Vienna Symphonic Library products, but Logic Pro X is responsible for handling the audio . . . I did a few experiments, and one of them verified that NOTION 4 generates MIDI Control Change (CC) Expression messages and sends them via an IAC Driver "virtual MIDI cable" when you are working with a NOTION 4 External MIDI staff that is configured to output to the respective IAC Driver "virtual MIDI cable" . . .
As noted by wcreed51, NOTION 4 has four MIDI ports, but there are 16 channels per MIDI port . . . . However, as I recall, I think that NOTION 4 only transmits CC messages over Channel 1 of MIDI Port A, which is a bit of a problem in this context . . . I am not certain that I understand what you want to do, and since I do not have Vienna Ensemble Pro 5 or any of the standalone Vienna Symphonic Library products (although I have VSL Legacy via Kontakt 6), I have to do a bit of guessing . . . Yet, as I read the original post I can make a list of things that can be done with Logic Pro X, NOTION 4, and the various Vienna Symphonic Library products, and each item on the list gets a "This can be done!" check . . . So, instead of focusing on whether it is possible to do something very specific but perhaps not so typical, it might be helpful to provide a bit of information on what you need to do, because there probably is a way to do what you need to do based on the way NOTION 4, Logic Pro X, and the various Vienna Symphonic Library products work and interact . . . NOTION 4 works nicely wth Logic Pro X, and they do ReWire 2 correctly . . .
Based on reports from other NOTION 4 users who post to this forum, NOTION 4 works nicely with Vienna Symphonic Library products, including Vienna Ensemble Pro 5 . . . 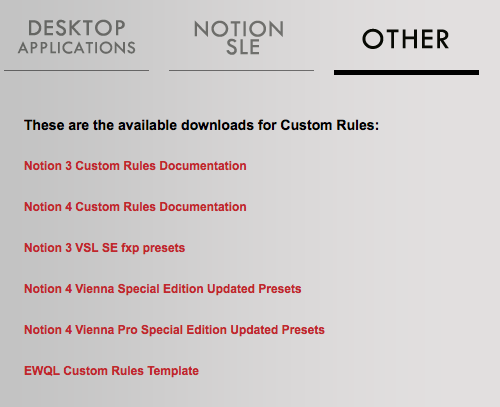 There are predefined NOTION 4 rules for some of the Vienna Symphonic Library instrument sets, and you can create your own user-defined custom rules . . . Intuitively, I think there probably is a way to do what you need to do within the framework that NOTION 4, Logic Pro X, and the various Vienna Symphonic Library products provide, which includes MIDI, ReWire 2, and "virtual MIDI cables" . . . Setting up the specific "sound set" for VSL on the external midi out of Sibelius, all works very fine! Controlling latency is a matter of configuring the audio buffers for NOTION 4 and Logic Pro X correctly and using ReWire 2, where specifically ReWire 2 handles synchronization . . . If you have AU or VSTi virtual instruments in Logic Pro X (which can include native Logic Pro X virtual instruments), then ReWire 2 will keep them synchronized with what you are doing with NOTION 4 . . . I think that the Sibelius external MIDI strategy was a "work-around" for Sibelius not being able to do what NOTION 4 does . . . The difference is that NOTION 4 is designed specifically to do this correctly without needing to use a "work-around" or alternative method . . .
To use all the detailed articulations, dynamics, playing styles, and so forth that one can specify with music notation, you need to host the VSTi virtual instruments in NOTION 4, and there are templates that use sets of tailored custom notation rules for Vienna Symphonic Library in NOTION 4 . . . It is like having a bicycle that only works when you ride it backward, which is Sibelius. You get it working, and everything is good. Then you get a different bicycle that works when you ride it forward, which is NOTION 4. Instead of asking "How do I ride it backward? ", you want to ask "How do I ride it forward?" . . .
You get to the same place, but with one bicycle you have to ride backward, while with the other bicycle you can ride forward . . . 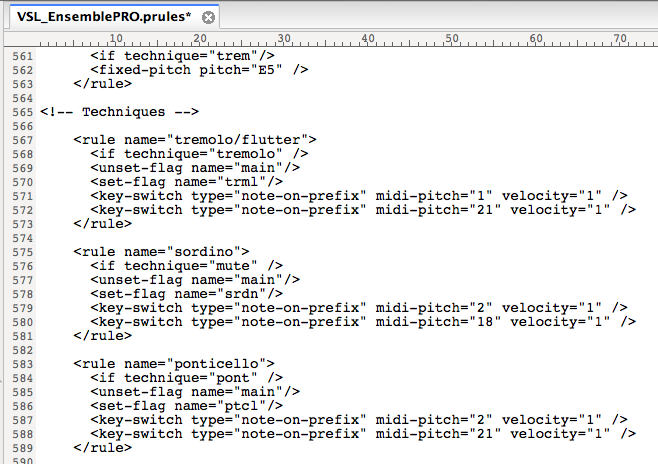 Although I have set differently, Sibelius works perfectly with VSL in the same mode of Notion 4. However I'l follow Notion 4 with great attention! Let's start over . . . This can be done with NOTION 4 in a ReWire 2 session, where Logic Pro X is the ReWire 2 host controller and NOTION 4 is a ReWire 2 slave. If you start Logic Pro X first, then it is done in a ReWire 2 session, but if you start NOTION 4 first, it is not done in a ReWire 2 session. The advantage of doing it in a ReWire 2 session is that ReWire 2 coordinates the transports and keeps everything synchronized . . . The concern I have regards "all the articulations are sent to the IAC bus" and the way "articulations" is defined . . . The key bit of information is that a NOTION 4 External MIDI staff does not know it is connected to VSL, MachFive 3, Reason 7.1, Addictive Drums, Logic Pro X native instruments, or anything else in a very specific way; so it follows generic rules rather than rules tailored to the specific sampled sound library and rendering engine . . . In the same scenario, it appears from what you wrote that Sibelius somehow knows it is sending MIDI to play VSL/VEP, although perhaps not . . . Regardless, it apparently works nicely in the scenario you described ("Sibelius ---> IAC Drivers ----> Logic Pro X ----> Vienna Ensemble Pro"), which is great! luigi.di.guida wrote: It's possible to replace Sibelius with Notion 4 and getting the same result? This might be possible, but since I do not have VSL/VEP, other than the VSL Legacy samples that come with Kontakt 5, I have no way to do experiments to determine whether this is possible . . . There is no predefined NOTION 4 template for doing this, but there might be a way to do it . . . The key bit of information is that tailoring everything (articulations, dynamics, playing styles, and so forth) to a specific sampled sound library and rendering engine is done in NOTION 4 using a mapping which includes a set of rules; and there are a few predefined mappings that are provided with NOTION 4 and have more intimate interactions with NOTION 4 . . . 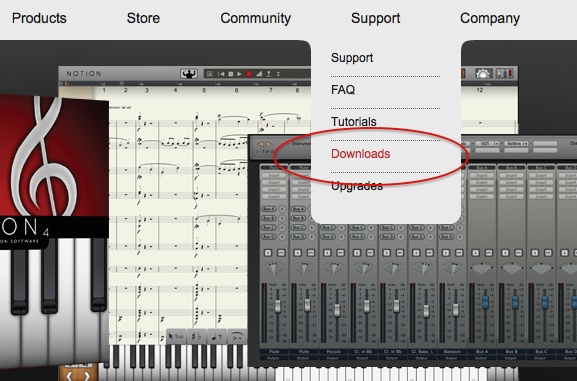 Specifically, there are four mappings for Vienna Symphonic Library products, as shown in the following screen capture . . . There is more information provided with NOTION 4, and one set of information is provided as "PluginData", which includes a specific set of tailored rules, which by convention are stored in rules files ("*.prules"), where the following images are partial screen captures provided to help get a sense of the types of information . . . I am not suggesting that one bicycle is better than another . . . Instead, I suggest (a) that there are different ways to ride bicycles and (b) that the best way to ride the NOTION 4 bicycle probably is different from the best way to ride the Sibelius bicycle . . . If you want to have all the detailed mappings of articulations, dynamics, playing styles (a.k.a., "techniques"), and so forth tailored specifically to one of the four supported flavors of Vienna Symphonic Library products, then the recommended strategy is to use the respective predefined NOTION 4 template, which in turn maps to hosting the Vienna Symphonic Library product in NOTION 4 or connecting to it directly, as the case might be . . . However, it is possible to create user-defined custom rules; and it might be possible to use a user-defined custom rules file with a NOTION 4 External MIDI staff, but at present all I can do is guess, since I have not experimented with this . . . Nevertheless, I did some different experiments and verified that a NOTION 4 External MIDI staff recognizes and correctly transmits certain types of articulations, where one example is staccato . . . If you do not need to be able to do all the elaborate activities, then NOTION 4 certainly can send MIDI to Logic Pro X based on music notation provided on a NOTION 4 External MIDI staff, and you have as many as 64 channels to do this, but with the caveat that certain types of MIDI information only is transmitted on Channel 1 of MIDI Port A, which is a bit of a problem, really . . . When you are doing everything in 64-bit mode on a computer that has at least 16GB of system memory, then you can host Vienna Symphonic Library products in NOTION 4 and for the products NOTION 4 supports with special templates, rules, and so forth, you get the full range of articulations, dynamics, playing styles, and so forth . . . So long as you have the audio buffers configured correctly and consistently for NOTION 4, Logic Pro X, and the various rendering engines, ReWire 2 will handle the synchronization, since this is one of the roles of ReWire 2 . . . Depending upon one's perspective, people in Australia and England drive on the "wrong" side of the road, so if you need to drive in those countries, then you need to learn how to drive on the "wrong" side of the road. Of course, in the US, everyone tends to drive on the "right" side of the road, which as best as I have been able to determine is the reason that there are no "roundabouts" anywhere other than in Massachusetts, which we know is a state where there continue to be British loyalists, disturbing as it might be . . .
could you tell me how do you assign the "Custom Rules" to an external MIDI port? luigi.di.guida wrote: Ok Thanks a lot! There are other folks who know a lot more about custom rules that I do, but based on what I understand, you can put a custom rules file in the same folder as a NOTION 4 score, and NOTION 4 will use those custom rules . . . Whether it uses the custom rules with a NOTION 4 External MIDI staff is another matter--and at present I do not know--but there clearly are generic rules in the NOTION 4 application package, and my experiments indicate that NOTION 4 applies articulations for NOTON 4 External MIDI staves according to generic rules, so I think this is what will happen . . .
(1) Custom rules tend to apply to everything, but there are ways to make them more specific . . .
(2) You need to understand a basic set of XML language constructs, and you need to understand the way custom rules work . . .
(3) At present, some MIDI messages only are transmitted on MIDI Port A and Channel 1, where as best as I recall this applies to Control Change (CC) MIDI messages . . .